Are you an incurable romantic searching for an engagement ring with an aristocratic air? Consider the marquise diamond: It’s beautiful. It has a royal pedigree. And it looks fantastic on the finger. But before you shop, learn what to look for. Pronounced “mahr-keez,” this graceful, elongated diamond has curved sides and pointed ends. Developed in France in the 1740s, legend has it that it was named for the Marquise de Pompadour, a mistress of King Louis XV, because its outline resembled the shape of her mouth. The marquise diamond is also called a navette (Old French for “little ship”). Similar in shape to the hull of a racing yacht, it was a favorite of early 20th century Edwardians, as sailing was a hobby of Britain’s King Edward VII and his wealthy contemporaries. The marquise diamond was also popular in the 1970s, especially in bridal jewelry, but fell out of favor to the square-shaped princess-cut diamond by the beginning of the 21st century. Yet the marquise continues to have many advantages. 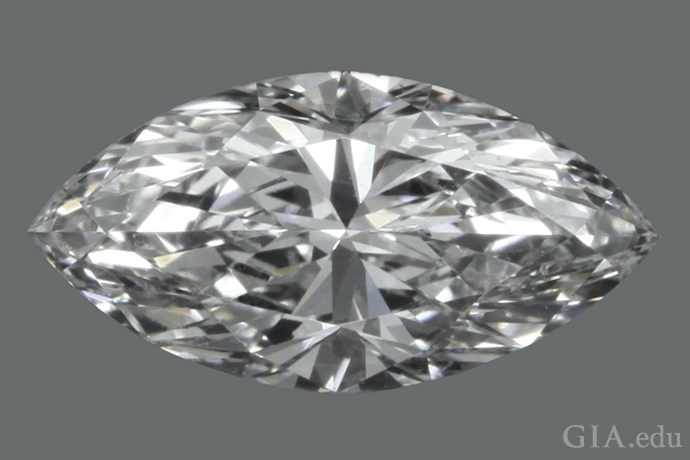 Because of its shape, a marquise diamond will look larger face-up than a round diamond of the same weight. Many brides also appreciate the fact that a marquise will make their fingers appear longer and more slender. Belly: The central area where the sides curve out the most. This is an important location on a marquise diamond–it’s where the width is measured. Point: Where the two curved sides meet at each end. Wing: The curved area reaching from the belly to the point. 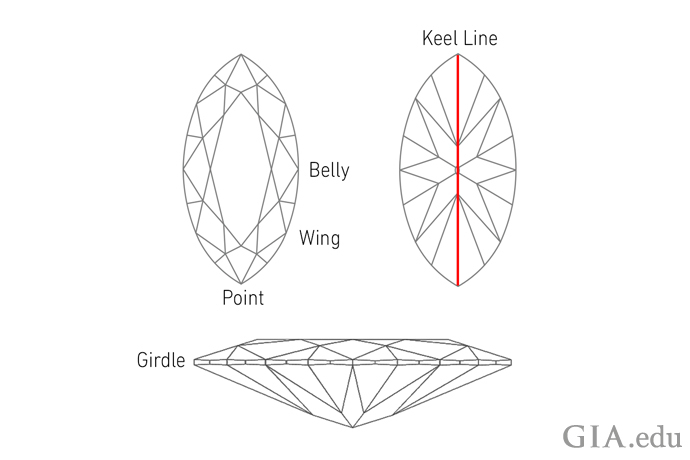 Knowing the parts of a marquise diamond anatomy (belly, wing, point, girdle and keel line) will aid discussing features that are important to you. 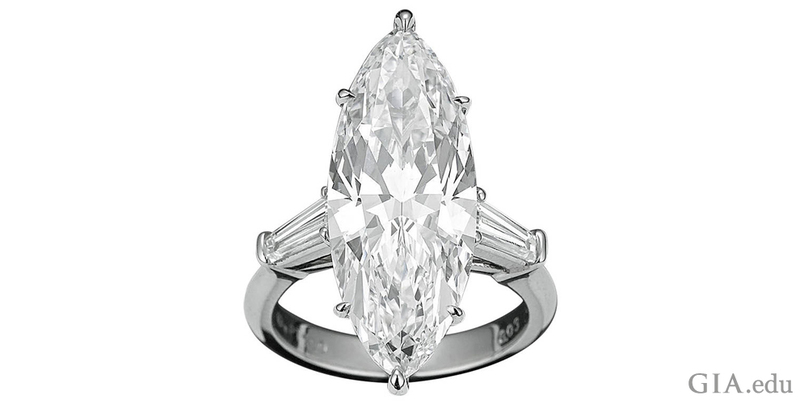 A number of factors help determine the attractiveness of a diamond cut in a marquise shape. Consider these as you choose your perfect marquise. The girdle functions as the diamond’s setting edge. When it is sufficiently thick, it reduces the risk of damage. Girdle thickness is evaluated by examining all areas of this narrow section that joins the top and bottom of the diamond. The girdle of a diamond cut in the brilliant style is scalloped and consists of “valley” and “hill” positions created where the upper and lower half facets meet. An overly thick girdle can contribute to a heavier diamond than its face-up appearance warrants, and a thin girdle can increase the risk of damage such as chipping. While girdle thickness is judged the same way in fancy shapes and rounds, certain fancy shapes, like the marquise, require special allowances. Since the most vulnerable areas of a marquise cut diamond are its points, it’s acceptable to have slightly greater girdle thickness there. Because a marquise’s pointed ends can be susceptible to breakage, some cutters use French tips to increase durability. That is, in place of a large bezel facet at each end, they modify star and upper girdle facets. Read our post on How to Select a Round Diamond Engagement Ring to learn more about the different facets used in diamond cutting. A diamond’s length-to-width ratio is an expression of the length (point to point) compared to the width (across the belly). In simple words, a common length for a marquise is about twice its width or a length-to-width ratio of 2:1. Here are some examples of marquise cut diamonds with various length-to-width ratios. Is there an ideal length-to-width ratio for marquise diamonds? 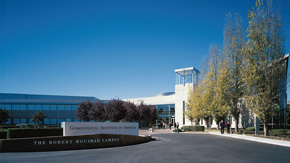 The length-to-width ratios for marquise diamonds submitted to the GIA laboratory most commonly range from 1.6:1 to 2.2:1. For longer marquise diamonds, it is very difficult for cutters to facet the diamonds in a way that keeps the face-up appearance of brightness and pattern as attractive as in the shorter range. Conversely, a very short marquise may appear “stubby.” Yet a short or long marquise might be the diamond that catches your eye. In the end, what appeals to you is what matters. 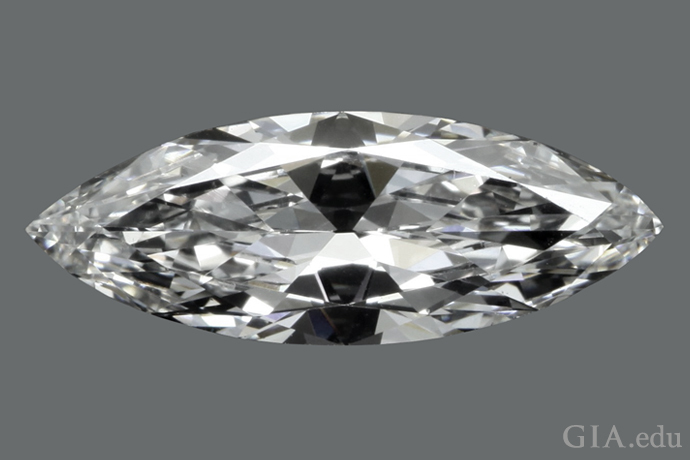 Symmetry is a key component of good design and along with shape appeal (below) is an important consideration in determining a marquise diamond’s overall visual appeal. 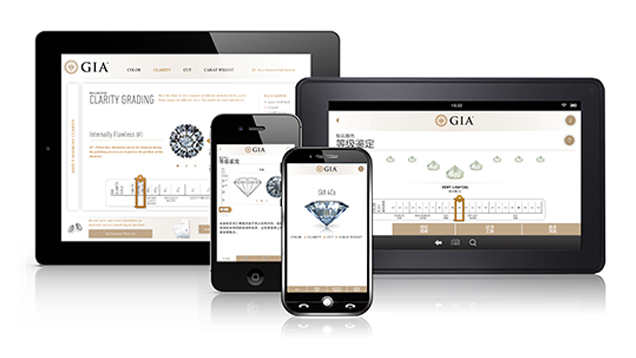 GIA evaluates a diamond’s symmetry based on visual observations and GIA diamond grading reports provide a symmetry assessment based on a five-point scale ranging from Excellent to Poor. 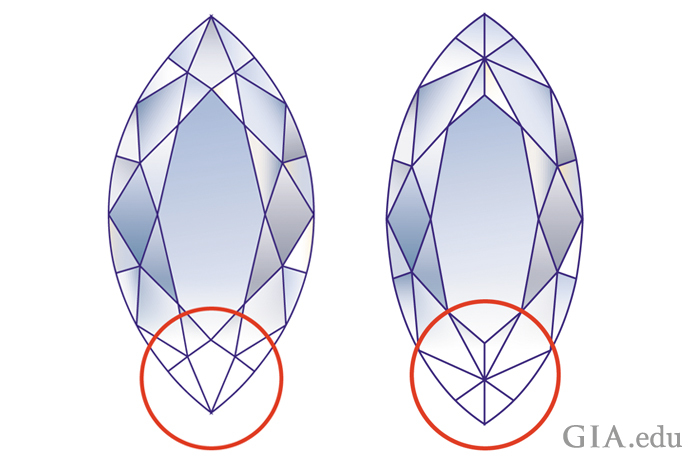 Here are some pointers you can use when evaluating the symmetry of a marquise diamond. Look at the curve of the wings to make sure they’re symmetrical. All the wings should have the same amount of curve. Draw an imaginary horizontal line across the diamond at the belly and observe whether the two halves are symmetrical in outline and equal in length. One half of the diamond should not be longer or shorter than the other. The symmetry of the facets also helps determine the beauty of the cut. Draw an imaginary line down the length of the diamond: The facets on the right and left halves should be the same shape and size and at the same relative locations along the wings. Then draw an imaginary horizontal line across the diamond, and see if the facets on the bottom and top halves are also symmetrical. 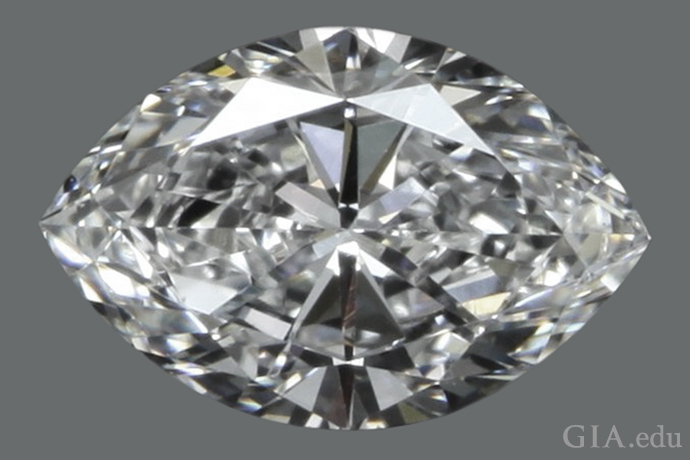 The more symmetrical the facets are, the more desirable the diamond will be. Look for any missing or extra facets. 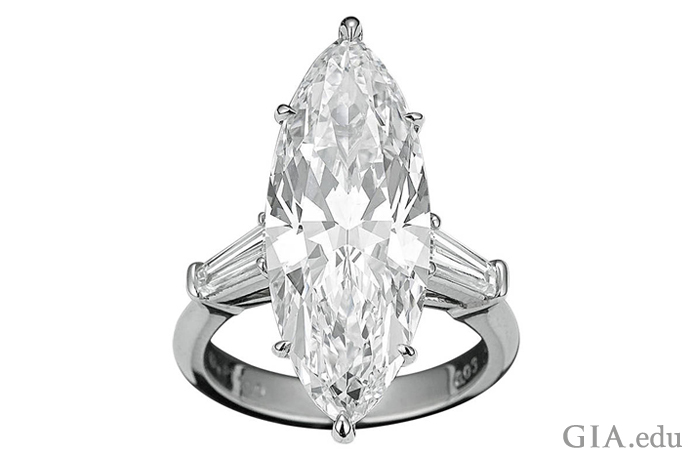 A marquise-shaped diamond is a regal choice for an engagement ring and it’s striking and flattering. Here are tips on what to look for when choosing one. It’s not enough for a marquise diamond to be symmetrical. It should also be graceful and pleasing. Symmetry and shape appeal are judged differently. Consider each diamond individually, comparing its parts to its whole. 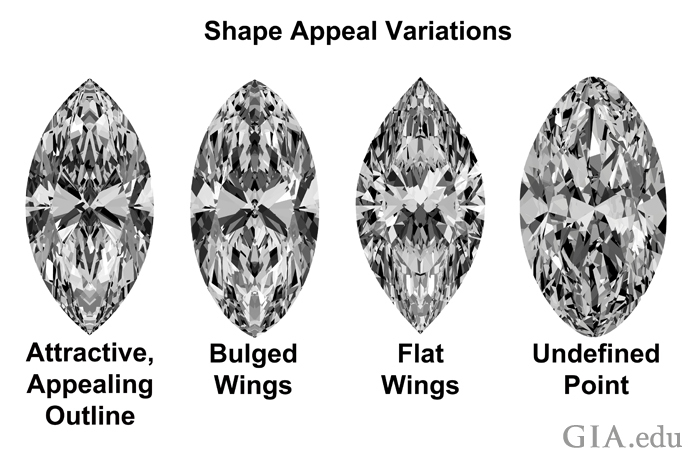 When jewelry professionals evaluate shape appeal, they consider a diamond’s appearance in relation to other diamonds of the same shape and cutting style. Flat wings – The wings are flatter, having less curve than usual. Bulged wings –The wings look ”plumper,” with more curve than usual. Uneven wings – One or more wings have a different amount of curve than the others. Undefined points – One or both ends are slightly rounded instead of pointed. Face-up, many marquise diamonds cut in the brilliant style show a dark shadow that resembles a bow-tie across the width of the diamond in the center of the table. A bow-tie can be light gray to black: The darker and wider it is, the more it can negatively affect the diamond’s appearance. Marquise diamonds typically will have some degree of a bow-tie, as those without a bow-tie usually lack brightness and tend to be dull. While a slight bow-tie can be visually appealing in a marquise, some bow-ties are so prominent they are distracting. A bow-tie is especially common in diamonds that have either shallow or very deep pavilions. Slightly deep pavilions and some faceting variations can minimize the effect. To see the extent of the bow-tie effect in a marquise diamond, try to view it as diamond graders do: Look at the diamond face-up, without magnification, under normal lighting conditions at a normal viewing distance, as if it’s being worn on your hand. Keep in mind that a diamond’s facets act like a series of mirrors, gathering light from around you and returning it back to your eyes. As you look at the diamond, your head will block some light from entering it. Therefore, you see a dark contrast where your head and shoulders are reflected: a bow-tie of darkness. The degree of darkness (gray to black) and severity of the bow-tie (slight to noticeable) can vary depending on the proportions of the diamond and your proximity to it. Wearing a marquise diamond is like having a bit of royalty on your finger. 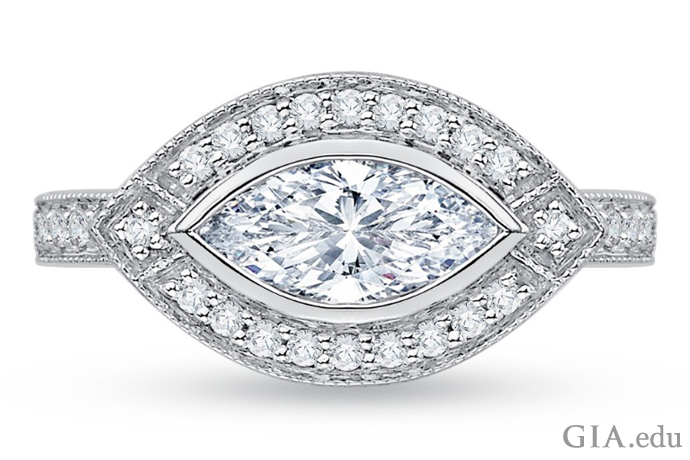 Now you know what to look for if your future bride has fallen in love with this diamond shape. 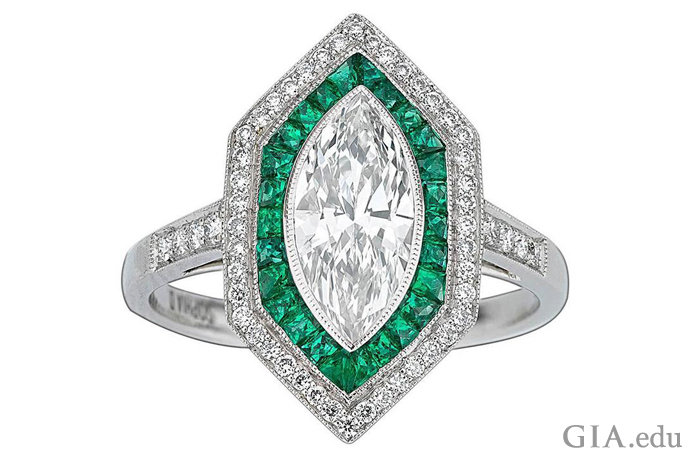 Not sure if a marquise diamond is right for your engagement ring? How about a round brilliant, an emerald cut or a heart shaped diamond?